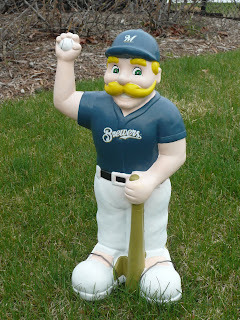 I woke up early today in hopes to obtain a Bernie Brewer 'Stach'ue. How early, 4:20! The time the parks were to open for the hunt was 5, and I was going the "Gateway to Milwaukee" aka Holler Park near the airport. It was clue #1, and was and easy clue to decipher, so I was nervous it'd be packed with a lot of people, but, then again, it wasn't too hard to figure out the remaining other clues either, so, if I get there a little ahead of 5, I felt like I'd be in good shape to obtain one of these Bernies. Well, I arrive to a cop car blocking the entrance, and about 10 people waiting patiently. Finally, the cop waves his light at us around 4:45 or so, and we all go running around the park. I see the children's playset, and think, what better spot for Bernie to be than on top of the slide, nothing....I walk through the woods, nothing... I look around and see that no one else has anything either. I continue to scour the woods, going off the paths even, until it strikes me, they wouldn't have hidden them where they could potentially get lost. I give up after about 40 minutes. I saw only one guy with a statue, and talking with others, that's the only one they saw as well. I call my friend Eric, and he said that the parks he checked out had been scavenged earlier, at 3 in the morning even, and were now bare. And as we now know, this had happened all over the area. Even reports of people picking up the Bernies directly behind the crews laying them down, and of course the peopl e who took multiples. Not one extra, not two, but dozens extra, screwing us all over. I woke up at an ungodly hour (for me), and I played by the rules, just to get nothing. It pissed me off. I even went down to the Bradford Beach area, as Eric said he had found some there around 5:30. He called a little later saying that he grabbed one for me. He felt bad about taking an extra Bernie, but he saw people with a shopping cart full....A SHOPPING CART!!! He knew since I had devoted my time to finding one and came up empty, that it would be in worthy hands. And I thank him for his kindness. It wasn't really the statue that I wanted, rather the chance for a prize, but I quickly got over my anger. I would have loved to have an autograph or a chance to sit in a suite, but the fun of the Brewers isn't fancy seats or having signatures of people who are my age or younger for my personal collection. No, the fun of the Brewers is going to the game itself, and sharing it with friends and fellow fans. Most of you reading this know the rest of the stories, and it wasn't the first, nor will it be the last, time a few rotten eggs ruin something for the majority. The fact is, the Brewers' marketing team did a fantastic job, perhaps too good! It was a fun idea, it gained a lot of attention from the fans who then bring that attention towards the team. And, making autographs, game used equipment, and luxury suites available to those who wanted to work for it (without shelling out wads of cash), is a plan that is alright with me. Not only was the plan a great one for the Brewers, it was a slam dunk for the Park System. Having to figure out the clues that were given for the previous week, meant that you had to research about your area parks. I personally learned that there are some cool water parks in the area, learned some history of the area, and got to explore pretty much all of Holler Park. So, I'm not going to blame the Brewers or the Park's staff for what happened. I think this turned out bigger than they could have imagined, and they've learned now that the "honor system" only works when everyone has honor. So, I don't think this sort of event should be scrapped, but instead, revamped. More indoor/fenced facilities: One of the locations was the Mitchell Domes, I'm assuming they hid the statues inside. By going indoors with it, you can now regulate who comes through the doors and how many items they come out with. Heck, why not get Miller Park in on the action, having people run through 4 levels of the concourse would be pretty cool. Show Statue to Attendant for prize: The outdoors thing was neat, and it would be unfeasible to have people watching the entire perimeter of places. So, you keep 1 (or more) workers that you have to hand a numbered statue to in order to determine if that statue has a prize associated with it. This won't necessarily deter the people from grabbing a prize early, as they could just show up later, but it does deter them from grabbing multiples. 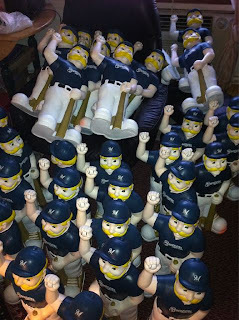 Let it Be Known Similar Statues Will Be For Sale: This one the Brewers did already. Shortly after people were trying to make hundreds of dollars on these statues, Miller Park announced they would have them for sale immediately. This foiled the plans of those who thought they'd strike it rich. Next time, let it be known that this sale will take place ahead of time. Make different parks open at different times: This is more for the convenience of some who might not have been able to search at 5. Multiple Days: Same as above, helps make it easier for people with different schedule. Or, if you don't get one on day 1, head back on day 2 to try again with a new strategy.